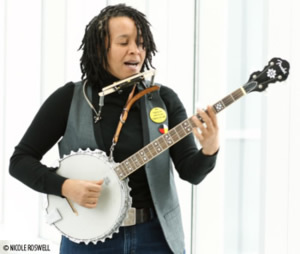 Faith Nolan (born 1957 in Halifax, Nova Scotia) is a Canadian social activist folk and jazz singer-songwriter and guitarist of mixed African, Mi'kmaq and Irish heritage. As stated on her website, "her music is her political work, a politics firmly rooted in her being working class, a woman, African Canadian and queer." Part of her activist work has been documenting the social, political and cultural history of Africville, a historic African Canadian settlement in Maritime Canada. This article on a Canadian musician is a stub. You can help Wikipedia by expanding it.